This week I made the Gimme Shelter book cover. The process of creating a book cover involves a lot of thought and planning. I wanted to make something striking that accurately reflected the contents of the book. 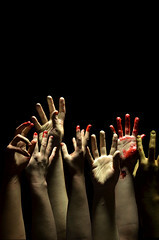 When all the stories came in, I dreamed up the image of a lot of zombie hands reaching upward. I didn’t have a lot of models available, so I decided to use multiple photos of my own hand to achieve the right look. I had some zombie makeup left over from a summer zombie photo shoot, so I painted up my right hand green with some nice Ben Nye. I also got out some nice chunky blood makeup – not the drippy stuff. I like dripping, but for the easy of photography, and to get the “guts” look, I went chunky. I took all of the pictures horizontally, using something I’d learned in my 365 Days project, where I took a horizontal photo and made it vertical to give the impression of the feet of a superhero taking off. I could have raised up the camera and reached upward, but that’s a little harder to do, because it means that I have to be low, the camera has to be high and the lights need to be above. This way, we are all on the same level. This doesn’t always work well. For example, if I had used drippy blood, it all would have been dripping the wrong way! Yet another reason to go chunky. I ended up taking 300 photos of my right hand, some closer to the camera and some far away, adding gore as I went along. Moving my hand and adding gore let me give the appearance of having lots of different hands, rather than just mine. A lot of the work for this cover was done in photoshop. I selected my favorite hands from the 300 photos I took and cut them out with the lasso tool in photoshop. That process was time-consuming and kind of annoying, but I listen to my podcasts while I do it, so that’s fun. At the end of that process, I have a bunch of hands to play with, and that is worth the obnoxious cutting process.The photo to the right is an example of how things looked with just a few hands cut out. Then I spent about two hours arranging hands. That was fun. I think I may have lost some time there, because I really didn’t feel like it took that long. All the hands are on separate layers in photoshop, which let me move them independently behind and in front of each other, or up and down on the page. This part was a lot of thought about arrangement, like putting together a bunch of flowers in a vase. I flipped half of the hands using photoshop to give the appearance of having both right and left hands in the image. Because someone the hands were closer to the camera, and some farther away, I have a different hand sizes. I changed the coloration of a few of the hands, some browner, some whiter, some greener, to give a nice variety to the hands. After many hours, I landed on an arrangement that I liked. I like how this arrangement seems to build, and I liked the great variety of hands, the mass of zombie hands, all reaching upward. Looking at the image, I wondered if I might have something stronger if I go for a more sculptural look, something where the hands are not a mass, but form a interesting and striking shape. So I went back into my image and “hid” a bunch of the hands in photoshop, and constructed an image I think of as the “Zombie Blossom” a sort of bloom of hands reaching upward. I like this image a lot (you can click on all of the images in this post to see them bigger) but looking at both the images side by side, I decided that the first image said more about the content of the book. Gimme Shelter is a zombie anthology, the voices of many authors, and having a cover that has so many hands on it seems to suggest “anthology” more than the image on the right does, as nice as it is. Also, a lot of the threat of zombies is the sheer number, so an image that is just crowded with zombie hands is more in line with the zombie genre. Often, in creative work, there is a lot of abandoning fun stuff for other stuff that just works better. That doesn’t mean that creating this image was a waste of time (it was still great fun to put together) just that it’s not the right image for Gimme Shelter. I’m not a graphic designer, and usually, when graphic design is called for, I go out and hire a graphic designer. A lot of book covers with beautiful illustrations and photography are ruined by poor graphic design. A good graphic designer adds a lot of polish and is worth every bit of cash they demand. I believe, honestly and truly, that I have added sales because of good graphic design to Shelter in Place. However, for Gimme Shelter, I had a pretty clear and simple idea in my head for the cover, so I decided to just go for it and see if I could pull it off. The idea was to have police tape with the title on it. So I created this yellow strip, looked up what the font was on police tape, and put it on the cover. There was a lot of the use of the tool “free transform” to make this happen. Most of what I use in photoshop is Curves, Layers, The Eraser and the Free Transform tool. After all that, I had my cover image! I am very happy with how this turned out. I feel it reflects the content of the book, is a striking image, and is something that I will be pleased to hold in my hands. Right now the finishing touches are being put on the Gimme Shelter anthology so soon we will be able to send it out to our Kickstarter supporters.